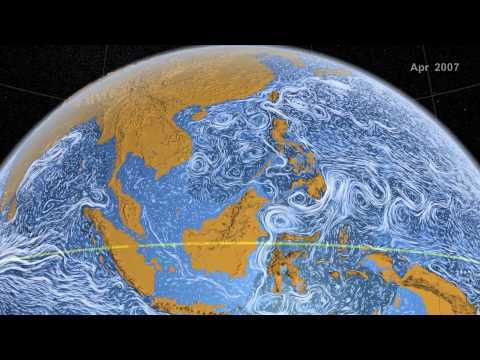 We use the Hybrid Coordinate Ocean Model extensively for high-resolution simulations. 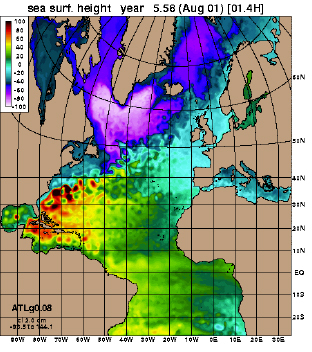 A sample HYCOM application is 60 year multi-decadal North Atlantic simulations. The computations are done at a resolution of 9 km at the equator, 7 km at mid latitudes, and 4 km in the Arctic, and with 32 vertical layers. The model is being forced with NCEP fields from 1948 through 1979, and with ECMWF fields from 1979 to the present. The interannual simulations would allow assessing circulation variability at interannual, decadal and longer time scales. With a 7 km (mid-latitude) grid, these simulations have sufficient resolution to provide a baseline depiction of the coastal regions, and can be used as boundary conditions for nesting of coastal Atlantic areas. 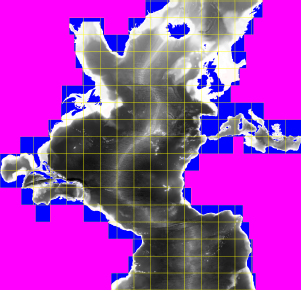 These simulations use over 80 million grid points and a very small time step and hence are computationally very demanding. The simulations are typically run on 256 or more procesors. The model is domain decomposed and parallelized using a SPMD approach in which the region is divided in smaller sub-domains or tiles, each processor dealing with one tile (Figure 8). Above Panel: Decomposition of the domain in tiles, for parallel computations. A regional example of Hybrid Coordinate Ocean Model is the Gulf of Mexico (GoM-HYCOM) configuration used for studying ocean response to hurricanes in a region with complex oceanographic features (Loop Current and eddies). This work is necessary to improve ocean model performance, which can potentially lead to improved hurricane intensity forecasts by coupled hurricane forecast models. 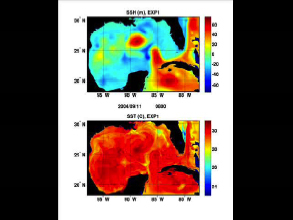 Comparison of Sea Surface Temperature (SST) before and after hurricane Ivan between a GoMHYCOM simulation and infrared satellite measurements. The two cold spots are regions where the supply of heat from the ocean to the storm is reduced, which acts to reduce storm intensity. They form where two cyclonic, cold-core eddies (blue spots, top panel) exist when the storm hits. The upper ocean warm layer is very thin over these features, allowing the storm to efficiently mix deeper cold water up to the surface. Dr. Villy Kourafalou and her group are actively involved in numerical modeling studies of circulation and transport processes in coastal and shelf seas. Their research topics include wind-driven circulation, river plume dynamics and interactions of coastal flows with large scale currents, with an emphasis on topographically complex marginal seas. Applications on ecosystem dynamics and development of operational oceanographic networks and forecasts are under way. 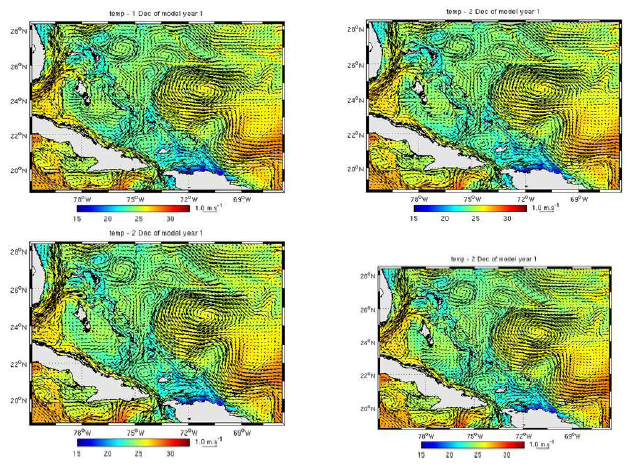 Current research projects (http://coastalmodeling.rsmas.miami.edu) include hydrodynamic models in the Intra-America Seas, the Gulf of Mexico, South Florida and the Aegean Sea. A multi-nested, downscaling approach has been developed to connect local to regional and global models. The modeling studies are closely linked to observational studies for model forcing and validation. Recent research activities have focused on the connectivity among remote coastal regions and the impacts of the related physical processes on ecosystem dynamics. Implications on socioeconomic and management issues are being established through collaboration with the National Oceanic and Atmospheric Administration and the South Florida Water Management District. Figure 11: Figure panel shows an example ocean model simulation for the Bahamas region performed as a part of the Bahamas Biocomplexity project. 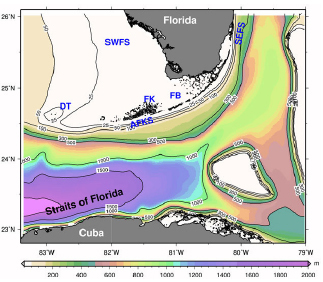 Six-hour interval snapshots of temperature and current vectors in the Bahamas model reveal the influence of the tide on the Bahamas shallow banks (for instance south and west of Andros). 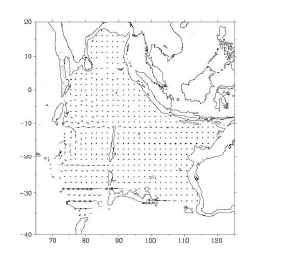 Dr. Iskandarani has been working on the development of unstructured grids ocean models. The geometric flexibility inherent in these grids improves the representation of complex coastline in computer models, enables multiscale simulation via variable resolution computational grids, and mitigates the cost of ocean modelling by localizing resolution in dynamically active regions. The result has been a series of models that differ primarily in their representation of the vertical solution structure. These include two and three-dimensional models, with either an isopycnal or terrain-following coordinate system, that solve the hydrostatic Navier-Stokes equations; a non-hydrostatic three-dimensional is currently under development. The original shallow water solver is based on a spectral element discretization of the flow region. The spectral element paradigm combines the geometric flexibility of low-order finite element methods with the high convergence rates of spectral methods. Its numerical attributes include very low numerical dissipation, and excellent phase propagation properties; furthermore, the dense local computational kernels at the element level, and the sparse inter-element communication patterns lead to extremely good scalability on parallel computers. 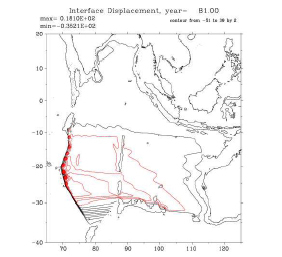 A sample application is shown in Figure 12 where the model was applied as a 1½ inverted layer model to simulate the abyssal flow in the indian ocean, and the dispersal of 3He plume emanating from line sources along the south-western ridges and north-eastern ridges bounding the domain. The unstructured grid was critical in enabling the economical representation of the flow through gaps at 30 S and 25 S in the 90 East ridge. The flow exchange between the eastern and western Central Indian basin occurs through zonal jets aligned along the gaps, and lend the 3He plume its south-eastern bending character in line with observations reported in Srinivasan et al. (2004). In additional to our spectral element shallow water solver, a high-order finite volume solver, with a nonlinear Flux Corrected Transport-based limiter has also been developed. This model is a precursor to a multi-layer version capable of handling vanishing layer thickness and isopycnals intersecting topography. This model is targeted at applications where water mass conservation during long integration time is critical, or where baroclinic dynamics need to be represented with a small number of vertical degrees of freedom. The three-dimensional spectral element model uses a terrain-following coordinate system with a relatively low order spectral element element representation in the vertical (Iskandarani et al., 2003). This model has been retrofitted with a Discontinuous Galerkin Method (DGM) to improve the model performance for advection dominated flow, and to stagger the tracer and vertical velocity with respect to the velocity collocation points. DGM, unlike the traditional finite element methods, does not require function continuity at inter-element boundaries, and hence is relatively insensitive to unresolved large gradients in the solution; furthermore numerical noise is damped selectively and remains localized. The improvements in model capabilities have been documented in Iskandarani et al. (2005). An example of DGM’s capabilities in shown in Figure 13, which shows the mixing of a two-density fluid adjusting under the force of gravity. The simulation was performed with a non-hydrostatic, vorticitiystreamfunction- based spectral element model. The model relies on the traditional (continuous) spectral element method to discretize vorticity and streamfunction, and on DGM for the discretization of density. The DGM was critical in enhancing the model’s stability by damping the numerical noise created by sharp density gradients; a continuous formulation would have required 100 fold increase in the resolution. These simulations are part of an ongoing effort to improve our understanding of oceanic mixing and our ability to parametrize it in large scale ocean models. Further improvements in algorithms and computing capabilities will allow us to push these simulation to higher and more realistic values of the Reynolds and Peclet numbers. Figure 12: Upper left: Elemental partition of the abyssal basin below the 3000 m isobath. Each element contains a 7*7 local grid for the velocity interpolation. Upper right: 3He distribution after 800 years of integration. Lower left: velocity vector, and lower right interface displacement. Figure 13: Simulation of a two-density fluid mixing using a spectral element model solving the vorticity streamfunction equations. The Reynolds number based on the gravity wave speed and channel height is 10, 000, while the Peclet number (ratio of viscous to diffusion coefficient) is 7. Özgökmen has been collaborating with Paul F. Fischer (http://www-unix.mcs.anl.gov/fischer/) in Mathematics and Computer Science Division of Argonne National Laboratory using Nek5000, the nonhydrostatic spectral element model developed by Fischer. Nek5000 integrates the unsteady incompressible Navier-Stokes equations within Boussinesq approximation. Nek5000 handles general three-dimensional flow configurations, supports a broad range of boundary conditions for hydrodynamics, and accommodates multiple-species transport. For problems having smooth solutions, the spectral element method achieves exponential convergence with N, despite having only Cº continuity (which is advantageous for parallelism). The convection operator exhibits minimal numerical dissipation and dispersion, which is important for high-Reynolds number applications. Efficient solution of the Navier-Stokes equations in complex domains depends on the availability of fast solvers for sparse linear systems. Nek5000 uses as a preconditioner the additive overlapping Schwarz method introduced by Dryja and Widlund (1987) and developed in the spectral element context by Fischer (1997) and Fischer et al. (2000). The key components of the overlapping Schwarz implementation are fast local solvers that exploit the tensor-product form, and a parallel coarse-grid solver that scales to 1000s of processors (Tufo and Fischer, 2001). The overlapping Schwarz method has provided a significant reduction in work over previous multilevel solvers (Fischer, 1997). In terms of parallel performance, Nek5000 achieved 376 GFLOPS on ASCI-Red (TFLOP machine based on 8186 Pentium-3 processors), an effort, that was recognized with the Gordon Bell Prize (Tufo and Fischer, 1999). The primary objective of the on-going research effort is to conduct direct numerical simulations (DNS) and large eddy simulations (LES) bottom gravity currents in stratified environment and over complex topography ( Özgökmen et al., 2004a,b; 2005; Figure 14) These results have been subsequently utilized to develop parameterizations of gravity current mixing in HYCOM (Chang et al., 2005; Xu et al., 2005). (i) Implementation of the Reduced-Order Information Filter (ROIF) for assimilation of ocean data into high resolution simulations of coastal and ocean circulation by the HYbrid Coordinate Ocean Model (HYCOM). (ii) Development of particle filters for both forward and inverse prediction problems in both the Eulerian and Lagrangian framework. 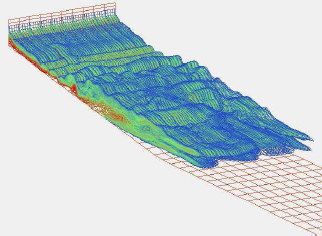 Figure 14: (Left panel) Distribution of salinity anomaly in a 3D nonhydrostatic numerical simulation for a flow over complex bottom topography. Details can be found in Özgökmen et al. (2004b) and a sample animation is available from: http://www.rsmas.miami.edu/personal/tamay/3D/bp14.gif. 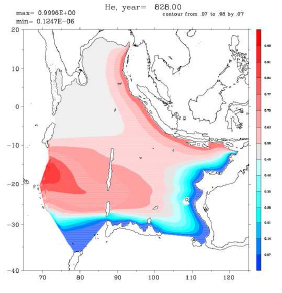 (Right panel) Snapshot of salinity anomaly for a flow reaching neutral buoyancy when the ambient fluid is stratified by stable linear temperature distribution ( Özgökmen et al., 2005). A sample animation is available from: http://www.rsmas.miami.edu/personal/tamay/3D/ts21-S.gif. 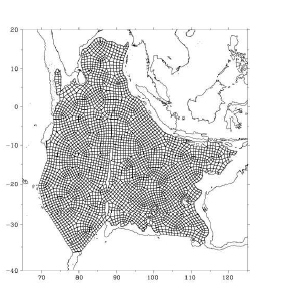 These computations have been carried out with 4 million grid points. 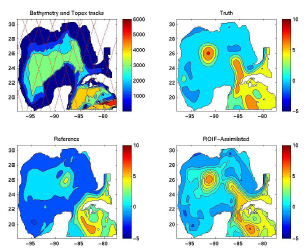 Figure 15: Snapshots of Sea Surface Height from the truth run and the twin experiments using ROIF. The satellite altimeter tracks are shown on the top left. The ROIF assimilation reproduces some of the meso-scale features in the truth runet al., 1999; 2002) and for drifters ( Özg&oumlkmen et al, 2003). 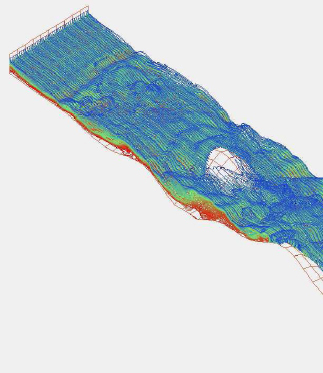 In comparison to other available assimilation technology, ROIF appears advantageous in accurate and timely reconstruction of meso-scale features that is relevant to operational requirements for high resolution estimates of the velocity fields in coastal and ocean environments.